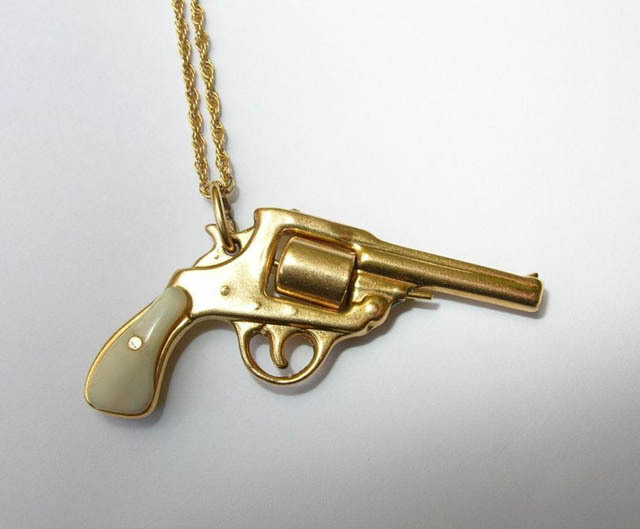 Here is a fun and interesting revolver pendant made of 14k gold with a mother of pearl handle. This is an excellent replica with a lot of detail and the cylinder also rotates! It comes on a 14k gold chain and is in excellent condition. A nice, large size, not a petite charm bracelet sized charm. Stamped “14k” on the nose of the gun. It has also been acid tested for gold content. Take a look at some more vintage gold guns.